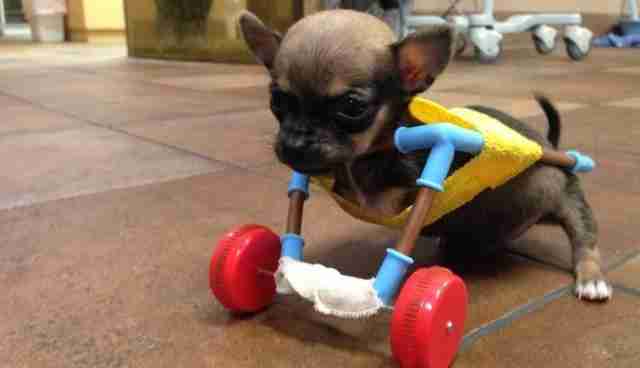 Life just keeps getting better for Turbo Roo, a chihuahua with a disability. Last month, the tiny puppy was surrendered into the caring hands of veterinarians, who -- despite others suggesting that the pup be put down -- saw him as a life worth saving. In the hopes of making things easier for the dog who was born without front limbs, staff at the Downtown Veterinarian in Indianapolis sought to get him a mobility cart. 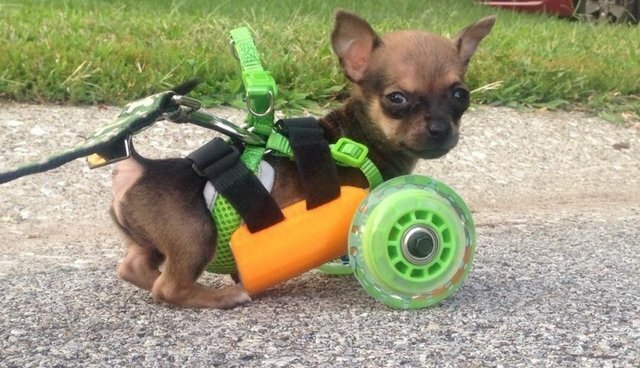 But since there aren't any carts on the market made to fit pups as petite as Turbo, the vets got creative -- crafting one themselves out of toy parts. Word spread of the vets' ingenuity and dedication in improving the little dog's life, and donations began to pour in from folks around the country who wanted to know how to help as well. One of those people was Mark Deadrick, owner of 3dyn, a company that fabricates parts for the aerospace industry. "We have capabilities to make just about anything, but we lean toward things that we find interesting," Deadrick told news station KERO. "Usually that's something that either flies, has wheels and goes fast. Turbo Roo meets that requirement (sans the fast part I suppose) and I thought I'd spend a small amount of time coming up with an interim solution." It wasn't long before Deadrick had dramatically improved upon Turbo's toy cart. "I just did some thumbnail measurements from photos and spend about 20 minutes designing a cart, hit print on one of our 3D printers and let it run for 4 hours," he said. Vet technician Ashley Looper, who's providing Turbo with a forever home, says that the little dog has been thriving in his new custom-built set of wheels since they arrived -- and he's getting faster every week.